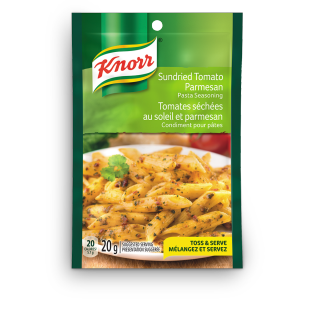 Our Sundried Tomato Parmesan Pasta Seasoning is a rich and creamy sauce with a mouth-watering aroma of sundried tomatoes. Great served with rigatoni, rotini or penne. Turn our deliciously seasoned pasta sauces and seasonings into the perfect meal. Pair with your favourite pasta, meat and vegetables to make a dinner your family is sure to love. Sundried tomatoes, corn syrup solids, salt, sugar, monosodium glutamate, dehydrated parmesan cheese, natural flavour, spices & spice extract, tomato powder, modified milk ingredients, onion & garlic powder, canola oil, dried spinach, hydrogenated soybean oil, dried parsley, tricalcium phosphate, maltodextrin, sodium phosphate, mono & diglycerides, colour, silicon dioxide, yeast extract, disodium guanylate, disodium inosinate and sulphites. 1. Cook 170 g dry pasta according to package directions. Drain, return to pot. 2. Add 3 tbsp (45 mL) water, 1 tbsp (15 mL) olive oil or vegetable oil and seasoning mix; mix well. Stir over medium heat until mixture sizzles. 3. Serve immediately. Makes 2 main dish servings or 4 side dish servings.